The Black Hand Gang Assassinated them because Austria-Hungary was picking on Bosnia which has a big Serbian population so the Black Hand Gang who's aim is to unite all the territories with significant Serbian population. The Black Hand Gang Plan decide to kill the heir's to the throne because of many problems. One of the members of the Black Hand Gang try to chuck a bomb at the cart the heirs are in but miss because franz ferdinand hits the bomb away with his elbow. 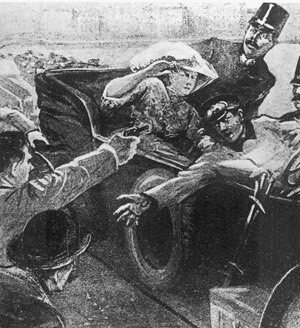 Gavrilo Princip was outside a sandwich shop and saw the heirs and then decided shot them. Not only killing the heirs but the baby with them. 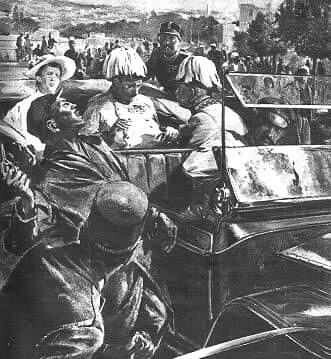 The Archduke Francis Ferdinand of Austria, nephew of the aged Emperor and heir to the throne, was assassinated in the streets of Sarayevo, the Bosnian capital, yesterday afternoon. His wife, the Duchess of Hohenberg, was killed by the same assassin. Some reports say the Duchess was deliberately shielding her husband from the second shot when she was killed. One victim was struck in the body and the other in the face; the telegrams are contradictory about which wound the Archduke suffered and which his wife. Two attempts were made on the Archduke's life during the day. He was in Bosnia directing the manoeuvres of the Austrian Army Corps stationed in the province, and had devoted yesterday to a procession through the capital. During the morning a bomb was thrown at the Imperial motor-car, but the bomb got knocked away. In the afternoon in another part of the town a Serb student fired a revolver at the car, killing both the Archduke and the Duchess. People are angry, furious and worried, then you would think, Why? Well, what has happened is that some horrible terrorists have decided to assassinate the heirs because of such a small pointless reason, first they try and throw a bomb at them and then to make things at the worst they shoot the heirs and their baby. Some people are puzzled because of many things for example where have they suddenly got a bomb and a gun from and then some people say 'Declare War?!' were not sure if this is too far or not but we all know that this is a massive deal and even if there was a war we would win it anyway.